On Thursday, September 10, the U.S. Census Bureau will release its annual report on health insurance coverage in 2008. The report includes the latest numbers on the uninsured and various forms of health coverage. EPI’s same-day analysis of this report will highlight trends in employer-sponsored health insurance, including valuable state-by-state coverage rates. 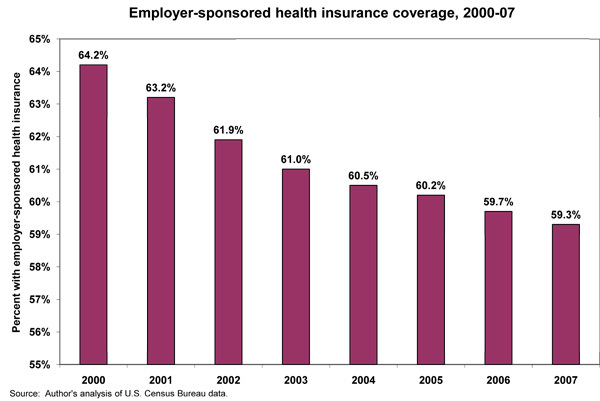 As of 2007, employer-sponsored health insurance remained the dominant form of health insurance in the United States. Over the 2000s, however, the share of Americans receiving coverage through an employer (whether their own, or that of their spouse or parent) has declined steadily. As of 2007, the share of individuals covered by employer-based policies was almost 5 percentage points smaller than in 2000 (see Figure). This decline, not surprisingly, coincided with a rise in the number of Americans without health insurance coverage. The health of the labor market, of course, has a direct impact on access to employer-sponsored health insurance, and rising unemployment correlates highly with declining insurance coverage. While unemployment worsened from 2007 to 2008 – from an average of 4.6% in 2007 to 5.8% in 2008 – the magnitude of that change was much smaller than in 2009, when unemployment has averaged 8.9% so far, hitting a high of 9.7% in August. Thus, the changes in health care coverage during 2008 are likely to be relatively modest, with the full impact of the worst of the recession still to come. The data reported on September 10 will, nevertheless, provide valuable insight into the state of insurance coverage in 2008.